Over the last few years I’ve been lucky enough to enjoy some really good bike rides with friends and family, through lots of bits of the UK and Europe that most people don’t get to see. The best of those was Lands End to John O’Groats, but I’ve also done a Coast to Coast (the Way of the Roses), Amsterdam to Berlin, Canal du Midi, and plenty of day trips out of London. 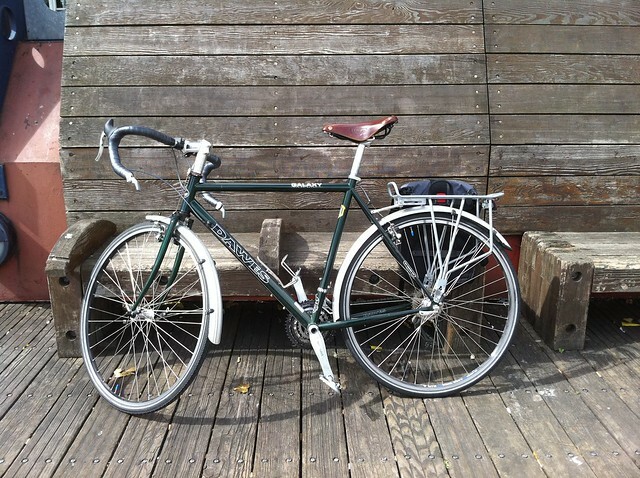 I’ve got a nice Dawes Galaxy touring bike which I bought second hand. It’s like the Volvo of bikes. Comfy for long distances, decent amount of room for hauling stuff, lots of places to attach things, and a bit on the heavy side. Since touring is mostly about going places you’ve never been, without assistance, you need a way of navigating. You can use paper maps, but you’ll be stopping every few minutes to check your route, or you’ll be mounting a waterproof map case to the handlebars and refolding it every 10 miles. Or you can use a GPS device. 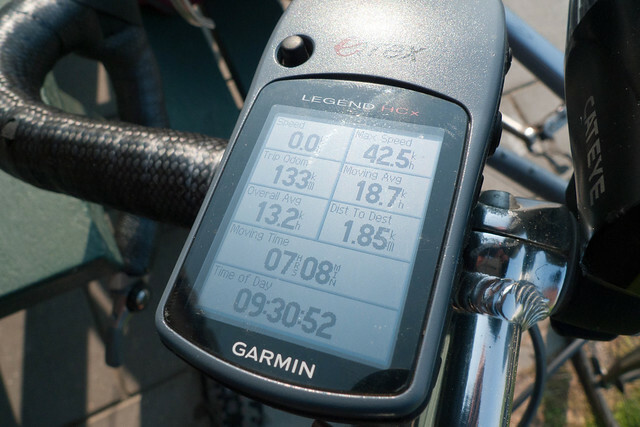 There are expensive bike specific models with cadence meters and competition modes, but those are for carbon fibre roadies, and you just want one with a screen and a simple map. 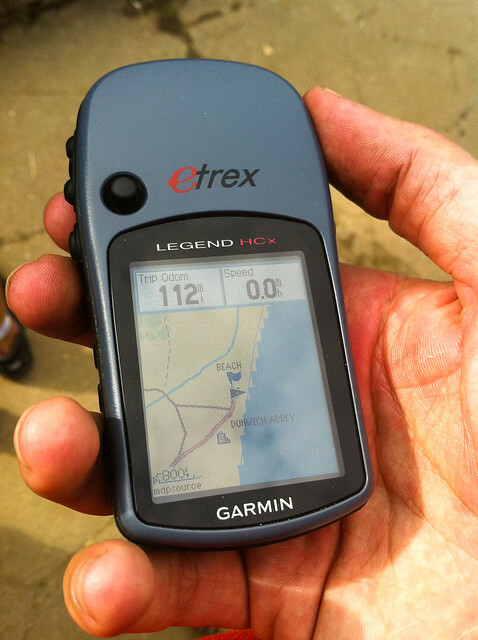 I’ve got an old Garmin eTrex Legend HCx, since discontinued. The battery lasts about 24 hours on a decent pair of NiMH AAs. The screen is a bit dim in sunlight, but the backlight works well when night falls. It’s durable: I can guarantee that it’s more waterproof than me, and I’ve dropped it numerous times as well as covering it in bike oil, etc. We’ve usually got some paper maps for backup, but the GPS is just so useful that unless the batteries fail, or we decide to go off the route, they rarely get used. It’s mounted to the handlebars, with the official Garmin mount. Because it rattles, I have some blu-tack that I shove underneath it to dampen the vibrations. You might fare better with a third-party manufacturer’s model. On the 2GB Micro SD card I’ve got the whole of UK OpenStreetMap loaded. I download it from Velomap and update it every few months. It’s a bit slow at rendering in built up areas, but it’s totally usable and way better than buying the expensive Ordnance Survey maps which are basically the same, with more out of date bits. If you can, grab the version with the hill contours – it’s useful to see them. Showing you a predefined track, and keeping you on it. Telling you your mileage, moving average speed, and so on. Logging your route for later. Working when your smartphone has run out of battery. Routing you to a waypoint. It’ll often try and take you along footpaths and motorways. Discovering what’s around you. The 2″ screen makes it difficult to see any distance at a usable level of detail, and the Points of Interest database is a complete pain to navigate. For that, use a paper map or your phone, unless you’re really stuck. Lots of well known trips have GPS tracks available for download already – just do a search for “A to B gpx” – but often you’ll want to draw out a new route. For this, I usually use Google Maps. I often plot a driving route from A to B, and then override it by dragging the route around to take it off the main roads and along quiet country lanes. It always snaps to the road network, so however you drag it you get a usable track. The topography isn’t always obvious, so I look at the satellite and terrain imagery on Google Maps, to make sure I’m not routing us up an unnecessary hill or similar. Then I export and download it as a KML file, and convert it to a GPX file with GPS Babel, before loading it onto the Garmin with the Basecamp software. I’d much rather use an OpenStreetMap based tool for all of this, but I haven’t found the right thing. Suggestions greatly appreciated! Lots of the rides we’ve done from London have been absolutely brilliant, but took a while to plan, plot and prepare for the GPS. I thought it’d be helpful to put a few of the best ones on their own site so they might appear in search results, saving people some time. The result is Good Bike Rides from London – a collection of day-rides we’ve done out of London, often to the coast, returning by train. There’s just four routes up there at the moment, but I’ve got quite a few track logs still to plough through and tidy up. Anyway, they’re all good, all recommended, and all ready for sticking on your GPS and hitting the road. Happy cycling. Update: I completely forgot to mention how useful CycleStreets is for cycle route planning, both long and short distance. I often check my customised route in Google Maps against it, and I love the altitude profiles it displays.